This off-white brick building rises up only a single floor with a flat roof. 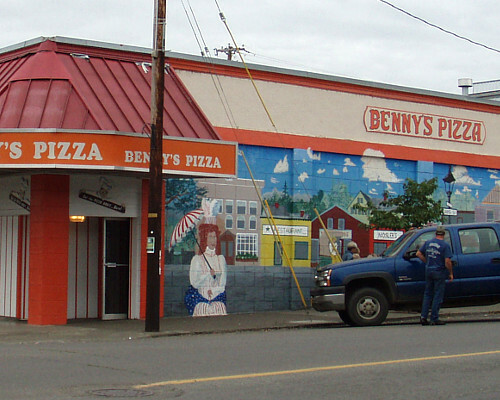 At the top of the building are two orange, horizontal stripes painted along the length of the building with a sign in the middle of the stripes that reads "Benny's Pizza". Along the side of the building facing the street is a painted mural, a depiction of an idyllic Mythic Wood from many years ago. It depicts a beautiful woman dressed in 20's regalia in front of a small town of many colored buildings, all under a beautiful blue sky with clouds. At the corner of the building is the front door under an orange awning with the name of the restaurant on it. The other side of the building is a cement wall of off-white next to a small parking lot. Along the street, lamps that are hung with baskets of flowers and seasonal banners that all have Mythic Wood and Daisy Street on them illuminating the area quite well after dusk. Walls of brown and tan surround several booths of black leather and granite top tables. In the center of the room are several more tables in neat rows with wooden chairs set around them. 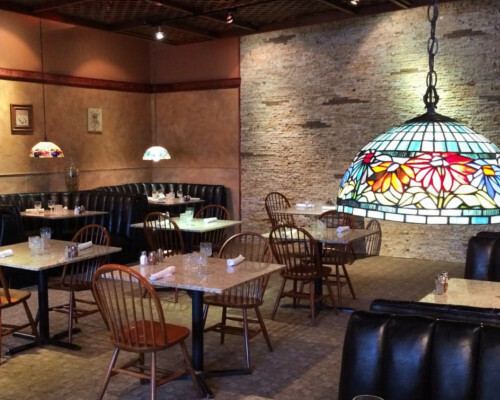 The high ceiling holds canned lighting that shines down on the tables, with Tiffany glass lamps hanging low over the booths. The walls hold simple pictures depicting various things such as hand-drawn herbs, or images from Italy. Along one wall there is a bar with several barstools in front, and several taps rising from the top. The tap handles are several different varieties both foreign and domestic. Behind the bar are bottles of liquor of all varieties and tastes, along with glasses of all shapes and sizes. There is also a window that leads to the kitchen beyond where the bakers can be seen preparing the pizza and pasta orders from the customers. 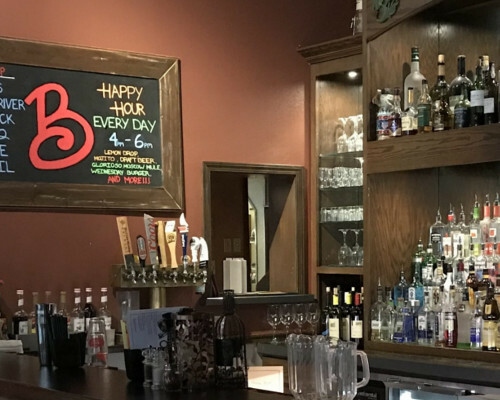 There is a blackboard sign next to the window with a large hand-drawn chalk "B" on it and displays the happy hour deals and new beers on tap.